incorporated in the futuristic motion picture. Farrah Fawcett-Majors, a gray-eyed blonde of dazzling beauty and an actress of considerable talent, was the wife of Lee Majors, TV star of "The Six-Million Dollar Man." Texas-born and an alumna of the University of Texas, Farrah first made her mark on network TV commercials, especially in her sales pitches for a balsam hair conditioner. She has also played guest star roles on many TV dramatic series and had a continuing role on TV's "Harry O," starring David Janssen. She has an important role in MGM's Logan's Run, which opened in 1976, a United Artists release. The film was directed by Michael Anderson from a screenplay by David Zelag Goodman based on the novel by William F Nolan and George Clayton Johnson. 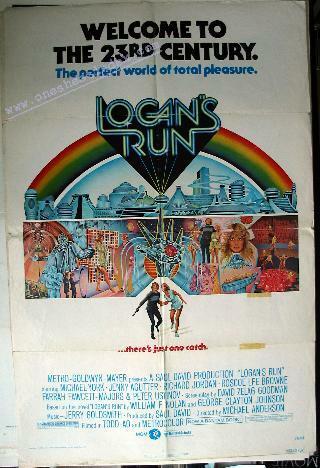 Because of its concern about life 300 years from now, Logan's Run became one of the most challenging projects ever undertaken by a group of film creators. Everything-exterior and interior settings, modes of transportation, food, drink, furnishings, clothing, laws, beliefs, jobs, hobbies, entertainment, jewelry, personal habits. Etiquette, manners, life styles, status symbols, even love-everything had to be devised and created especially for the film. The sets built at MGM were undoubtedly the most expensive erected at the studio since its great early days of musical spectaculars. Costs for interiors and exteriors would have been insurmountable if it had not been for the state of Texas. In Dallas, Houston, and Ft. Worth, producer David and director Anderson located the most advanced architecture in America and incorporated the futuristic structures into Logan's Run. Sets for Logan's Run built at MGM studios were eye-popping! On Stage 15, largest sound stage in the world, 'two important backgrounds- Sandman Headquarters and the New You Shop-were constructed. The complete interior of Stage 30 housed two fabulous settings, the Ice Caverns and the awesome Carrousel, an ingenious product of construction knowhow, special effects wizardry and inventive movie magic where an audience of 500 filled the arena to cheer the dozens of stunt people who portrayed Lastday celebrants striving for life renewal. Two sound stages were required to handle one single set for Logan's Run. An opening was made between two adjoining stages to provide space for the maze tunnel along which the full-scale maze cars sped. The electrically-powered, teardrop-shaped plastic bubbles are so well designed that they can easily be converted to actual street travel. Another stage was fully utilized to construct the decaying, vine-infested remains of the United States Senate chambers where Peter Ustinov lives with his hundreds of cats as companions. The felines, provided by Hettie Kram of Cat Care Shelter, West Los Angeles, lived on the set for almost two weeks while performing their roles. Although the United States is now celebrating the Bicentennial of its Declaration of Independence from England, its owes the "motherland" an unending debt of gratitude for Britain's continued export to Hollywood of talented screen beauties. These have included Elizabeth Taylor, Jean Simmons, Julie Christie, Vanessa Redgrave and Julie Andrews. And now for a 200th birthday present the British have sent us Jenny Agutter, a green-eyed young charmer whose skilled dramatic talents are a perfect match for her highly photogenic face and figure. Miss Agutter (the accent is on the "Ag") makes her Hollywood debut as the feminine lead of Saul David's production of Logan's Run for Metro-Goldwyn-Mayer. The provocative adventure drama that examines the life and times of the 23rd century, is released by United Artists, a Transamerica Company. Jenny stars with Michael York, Richard Jordan, Roscoe Lee Browne, Farrah Fawcett-Majors and Peter Ustinov. In the role of Jessica, she has the romantic lead opposite York, portraying a conscientious objector to the law that forbids life beyond the age of 30. Michael Anderson directed Logan's Run from a screenplay by David Zelag Goodman based on the novel of the same name by William F Nolan and George Clayton Johnson. Michael York, the Oxford-educated British star, has demonstrated that he is equally at home in the 17th century or the 23rd century. Now starring in the Saul David Production of Logan's Run, York portrays the unusual and demanding role of a member of an elite police force who tries to circumvent 23rd century society's stern and brutal law which decrees that life must end for all at age 30. He came to this lavish and provocative futuristic drama almost fresh out of the 17th century when he won wide acclaim for his performances in "The Three Musketeers" and "The Four Musketeers." Director of Photography .......... ERNEST LASZLO, A.S.C. Special Photographic Effects ...... L. B. ABBOTT, A.S.C.